Last Thursday evening I put the final touches on my latest painting (above). 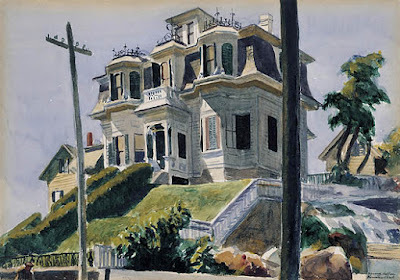 Then on Friday morning I viewed an Edward Hopper painting in the Philadelphia Museum of Art's American Watercolor in the Age of Homer and Sargent exhibition that reminded me how Hopper's influence has often steered me in my choices of what to paint. When I was a kid I'd see these mansard roofs in the old sections of downtown Rochester, NY and wondered about them- they seemed radically different than the California-modern house I was growing up in. To my young eyes they were unfathomably old and mysteriously exotic. But even then I had to admit they created a more striking silhouette against the sky than more ordinary buildings. My painting stemmed from some drawings I made on location in Buffalo, NY as part of my being Artist in Residence at Burchfield Penney Art Center (BPAC). 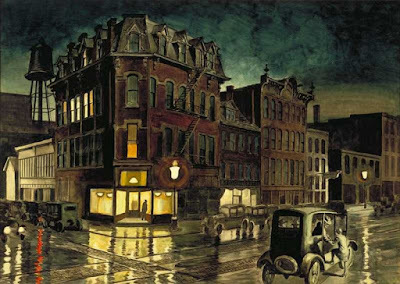 Tullis Johnson, one of BPAC's Curators told me that the building Charles Burchfield had used as the centerpiece of his famous watercolor Rainy Night was still intact in downtown Buffalo. So on a frigid January afternoon I hurried down to see the old structure. It was too windy to work outside but I was able to make sustained charcoal drawings of it through the windows of the adjacent Public Library branch. 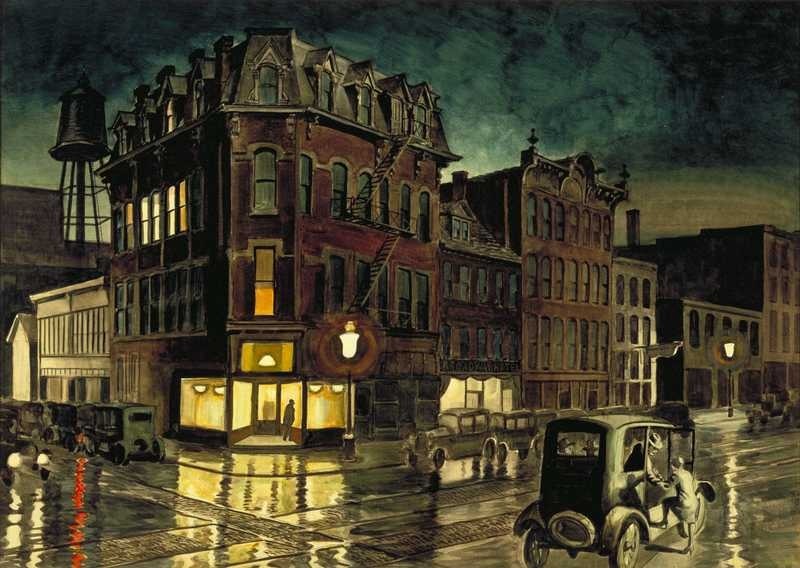 Burchfield's painting deftly used the low hanging clouds to catch the strange greenish glow that reflects up from the city's lights. But the looming shadowed building itself has a eerie personality. It seems likely Burchfield chose this building not for its age but for how its network of interlaced shapes would provide his painting with a deepened note of emotion. inches, 1924, National Gallery of Art, Washington, D.C.
Kathleen Foster, the Curator at the Philadelphia Museum who organized the American Watercolor show writes in her catalogue essay about Hopper's choice to paint subjects that were some 50 years old even in his time. "Hopper had no nostalgic agenda. Attracted by the complex sculpture of the the house, its dark and light patterns of window and sunlight, he simply enjoyed confronting the quirky palimpsest of the American landscape." The American Watercolor exhibition continues through May 14, 2017. P.S. You can see a selection of the preparatory drawings made by both me and by Charles Burchfield from the building in Buffalo at my earlier blog post. Saved from a Cloud of Stinging Beasts!